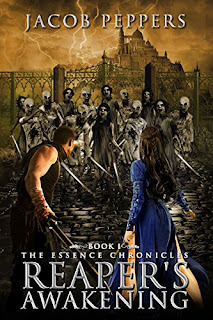 Reaper's Awakening: Book One of The Essence Chronicles by Jacob Peppers. Cameron Shale is a Harvester, an agent of the Church whose duty is to save the kingdom’s people by gathering the essence of those chosen to be sacrificed. He does his saving not with a surgeon’s knowledge, or a Priest’s prayers, but with the sword. They call him a murderer. They call him the Reaper. His kind are hated—and he more than the rest—but they are also necessary. For there is evil waiting, a plague ready to wipe out all those in its path, and it is only with the essences of those sacrificed that it is held at bay. They survived it once. They will not survive it again. But when a shadowy figure known only as Memory emerges leading a rebellion against the Church and king, Cameron is forced to ask questions about a past that has haunted him his entire life. The kind of questions that can only be asked with steel. The kind that can only be answered in blood. An interesting sounding story, and generally I thought the book was good, not excellent but good, with potential. The story follow Cameron Shale, a Harvester, who works for the Church to do their deed. At the start of the story, Cameron is a stoic, devout and loyal man to the Church, but as the book progresses, doubt begins to grow. I thought the story was interesting, but admittedly a little confusing to follow initially. The pieces did come together near the end. The main protagonist, Cameron, was done well, and his character was defined, but I did feel the other characters were less so. Overall I thought the book has potential and I enjoyed the twists in the story. The ending sets up nicely for the sequel which I will be keeping an eye on.